Stonehenge Aqua is a high quality watercolour paper that performs excellently with wet-on-wet applications or wet-on-dry applications. It’s crispness and excellent quality enables it to anchor work beautifully no matter what the technique. Lifting and blending are a dream on this paper allowing you the control you need to produce fine, elegant work. It’s absorbency is perfect for preventing bright colours drying to a dull tone. 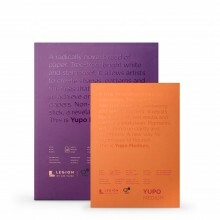 The flat paper dries flat and resists buckling, whether you’re using blocks or sheets. Stonehenge Aqua can be used for watercolour, pen and ink drawings, intaglio printing, calligraphy, pastel painting and silkscreen printing. 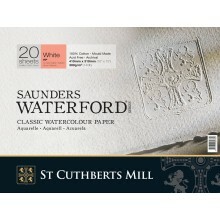 Stonehenge Aqua watercolour paper is available in blocks, with hotpress and not/ coldpress textured sheets. Every block contains 15 sheets of Stonehenge Aqua paper and each sheet is glued on four sides. These can be carefully removed when your work is dry using a butter knife. 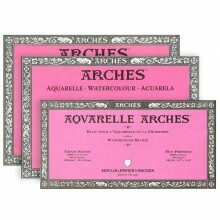 Stonehenge Aqua Hotpress is a superb paper for botanical illustration since is very smooth while still having a delicate fine texture that is ideal for coloured pencil and watercolour layering. This makes vibrant realistic paintings entirely possible. The water permeates the paper slowly allowing for you to produce fine details and subtle gradations without losing any vibrancy or radiance. Stonehenge Aqua Not (Coldpress) is an interesting paper for watercolour painters because of its rugged, textured surface that naturally receives applied moisture. 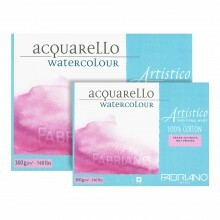 This makes it ideal for the blending and lifting of colour and enables you to create atmospheric complex paintings. Each sheet is made from 100% cotton and is acid and chlorine free, it has been sized with a synthetic sizing, that doesn’t contain any gelatine.